"I SAY TO YOU, NOT SEVEN TIMES BUT SEVENTY-SEVEN TIMES"
Last Sunday's readings reminded us of our God-given responsibility to care for and correct one another. This Sunday, that theme is brought to its natural fulfillment in our duty to forgive others, always. In our first reading (Sirach 27:30 - 28:7), the author Ben Sira teaches us that the refusal to forgive, clinging to "wrath and anger", are in themselves sinful acts. Wrath and anger are hateful things, yet the sinner hugs them tight. The vengeful will suffer the LORD's vengeance, for he remembers their sins in detail. Forgive your neighbor's injustice; then when you pray, your own sins will be forgiven. Could anyone nourish anger against another and expect healing from the LORD? Could anyone refuse mercy to another like himself, can he seek pardon for his own sins? If one who is but flesh cherishes wrath, who will forgive his sins? Remember your last days, set enmity aside; remember death and decay, and cease from sin! Think of the commandments, hate not your neighbor; remember the Most High's covenant, and overlook faults. In our Gospel passage (Matthew 18:21-35), we hear a continuation of last Sunday'sGospel, where Jesus instructed his disciples on the process of reconciliation and then gave them the power to reconcile sinners. In the very next sentence, Peter asked Jesus how often must he forgive. Jesus' answer probably shocked him, as it went far beyond what would have been Jewish custom of the time. Peter approached Jesus and asked him, "Lord, if my brother sins against me, how often must I forgive? As many as seven times?" Jesus answered, "I say to you, not seven times but seventy-seven times. That is why the kingdom of heaven may be likened to a king who decided to settle accounts with his servants. When he began the accounting, a debtor was brought before him who owed him a huge amount. Since he had no way of paying it back, his master ordered him to be sold, along with his wife, his children, and all his property, in payment of the debt. At that, the servant fell down, did him homage, and said, 'Be patient with me, and I will pay you back in full.' Moved with compassion the master of that servant let him go and forgave him the loan. When that servant had left, he found one of his fellow servants who owed him a much smaller amount. He seized him and started to choke him, demanding, 'Pay back what you owe.' Falling to his knees, his fellow servant begged him, 'Be patient with me, and I will pay you back.' But he refused. Instead, he had the fellow servant put in prison until he paid back the debt. Now when his fellow servants saw what had happened, they were deeply disturbed, and went to their master and reported the whole affair. His master summoned him and said to him, 'You wicked servant! I forgave you your entire debt because you begged me to. Should you not have had pity on your fellow servant, as I had pity on you?' Then in anger his master handed him over to the torturers until he should pay back the whole debt. So will my heavenly Father do to you, unless each of you forgives your brother from your heart." Our Epistle reading (Romans 14:7-9) is a short passage, probably taken from a poem or song, that underscores the transcendent nature of our relationship with Christ. When we die, we do not lose our relationship with the Lord. Brothers and sisters: None of us lives for oneself, and no one dies for oneself. For if we live, we live for the Lord, and if we die, we die for the Lord; so then, whether we live or die, we are the Lord's. For this is why Christ died and came to life, that he might be Lord of both the dead and the living. Forgiveness is the opposite of vengeance; you can't have both at the same time. 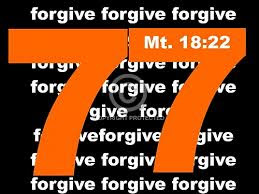 When we find ourselves resenting the fact that we must forgive someone over and over for the same offense, it might do us good to consider that our Father in heaven has already forgiven us far more than seventy-seven times.